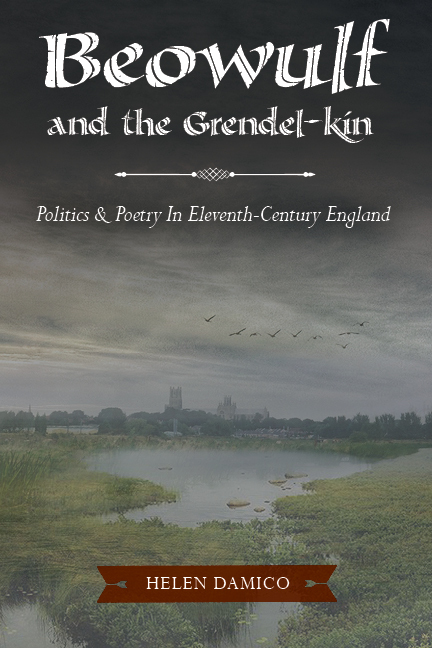 In Beowulf and the Grendel-kin: Politics and Poetry in Eleventh-Century England, Helen Damico presents the first concentrated discussion of the initiatory two-thirds of Beowulf’s 3,182 lines in the context of the sociopolitically turbulent years that composed the first half of the eleventh century in Anglo-Danish England. Damico offers incisive arguments that major historical events and personages pertaining to the reign of Cnut and those of his sons recorded in the Anglo-Saxon Chronicle, the Encomium Emmae Reginae, and major continental and Scandinavian historical texts, hold striking parallels with events and personages found in at least eight vexing narrative units, as recorded by Scribe A in BL, Cotton Vitellius A.xv, that make up the poem’s quasi sixth-century narrative concerning the fall of the legendary Scyldings. Given the poet’s compositional skill—widely relational and eclectic at its core—and his affinity with the practicing skalds, these strings of parallelisms could scarcely have been coincidental. Rather, Damico argues that examined within the context of other eleventh-century texts that either bemoaned or darkly satirized or obversely celebrated the rise of the Anglo-Danish realm, the Beowulfian units may bring forth a deeper understanding of the complexity of the poet’s compositional process. Damico illustrates the poet’s use of the tools of his trade—compression, substitution, skillful encoding of character—to reinterpret and transform grave sociopolitical “facts” of history, to produce what may be characterized as a type of historical allegory, whereby two parallel narratives, one literal and another veiled are simultaneously operative. Beowulf and the Grendel-kin lays out the story of Beowulf, not as a monster narrative nor a folklorish nor solely a legendary tale, but rather as a poem of its time, a historical allegory coping with and reconfiguring sociopolitical events of the first half of eleventh-century Anglo-Saxon England.